My new CrazyTalk Animator 3, G3 Character, Reddy the color monkey is both finished and still a work in progress. Previously I thought I might have a demonstration animation completed for this post but, after receiving some sought after feedback on Reddy with some very good suggestions I decided to refine him even further. Most of the changes were to the line work around his joints so when his limbs move the join is less obvious and looks more natural. 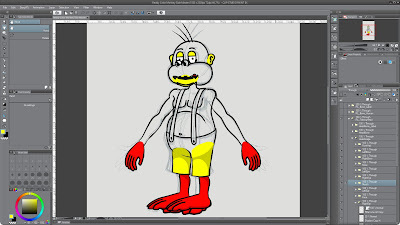 The more obvious change is that I added some shadow to him to make him look a little more three dimensional (so he'd match better with Garry Pye's excellent characters, props and backgrounds, which do have shadows and I will probably use quite a bit with Reddy). Reddy, disguised as President Trump. Additional Characters and props by Cartoon Solutions. Having done those changes, the front facing character rig of Reddy is complete. However, he's still a work in progress because I've been working on a 315 degree angle version of the character. This angle turns Reddy slightly to one side making it possible for him to walk left and right more naturally, and something a front facing character just can't do. To do this the body and the head need to be redrawn whilst the rest of his body components can be copied across from the front facing view then modified and repositioned to fit the 315 angle. The trickiest part is Reddy's mouth sprites which need the most adjustment. Creating Reddy's 315 degree view in Clip Studio Paint. I have actually written a short script and storyboarded my first Reddy animation which I hope to complete very soon. From there I'll make Super Bluey and Great Greensbury versions of the character (Blue and Green color monkeys if the names didn't tip you off). Once that's done I plan to make the characters available in the Reallusion Content Marketplace. Such a little character and such a lot of work goes into making him! He looks amazing and you have some serious talent. I love the colour you chose for him! Love this character, can't wait to play around with it on CTA! Any eta on a release date? Hopefully some time this week. The character's finished, I just need to get some time to set up a store in the Marketplace.